Moody’s Analytics estimates the economic cost of Florence at $38 billion to $50 billion ... In Texas, the Harvey tally reached $133.5 billion ... In Puerto Rico, Maria cost $120 billion ... In Florida, Irma damage was $84.2 billion. We’re starting to see the consequences of President Trump's war with his own Justice Department and the intelligence community, sources tell Jonathan Swan and me. 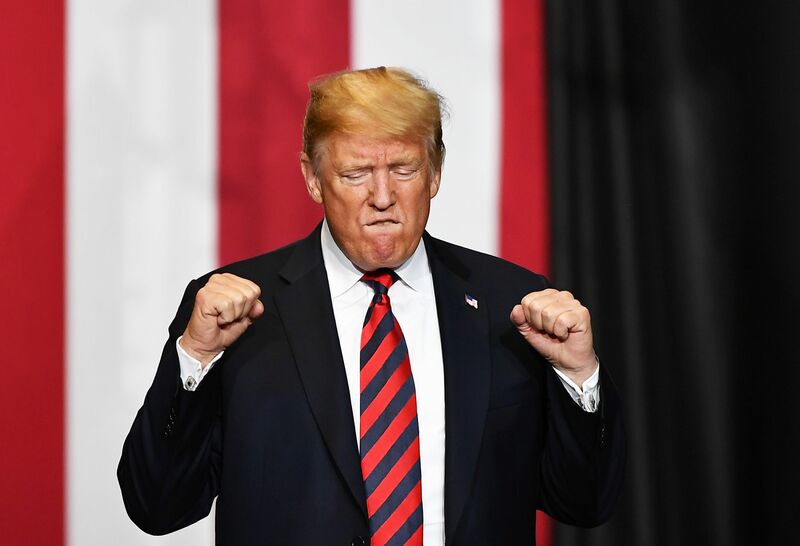 His constant disparagement of the FBI has left heaps of grievances among current and former officials — many of whom have extensive documentation that could cause massive problems for him as it dribbles out. The fallout ... Rosenstein's denial, which convinced no one: "I never pursued or authorized recording the President and any suggestion that I have ever advocated for the removal of the President is absolutely false." Trump last night at a rally in Missouri: "You've seen what happened in the FBI and the Department of Justice. The bad ones, they're all gone. They're all gone ... But there is a lingering stench and we're going to get rid of that, too." Be smart: The leak is a tiny indication of how much special counsel Robert Mueller knows that we don't — and has known for months. P.S. Book coming Dec. 4 ... Andrew McCabe, "The Threat: How the FBI Protects America in the Age of Terror and Trump"
"Senate Judiciary Committee Chairman Charles E. Grassley (R-Iowa) gave [Christine Blasey] Ford one more day to respond to his offer for her and [Brett] Kavanaugh to testify before his panel on Wednesday," per the WashPost. Ford lawyer Debra Katz had emailed Grassley aides: "Your cavalier treatment of a sexual assault survivor who has been doing her best to cooperate with the Committee is completely inappropriate." "I never told anyone for decades — not a friend, not a boyfriend, not a therapist, not my husband when I got married years later." "It doesn’t surprise me one bit that for more than 30 years, Christine Blasey Ford didn’t talk about the assault she remembers." "Keep the faith. Don’t get rattled by all of this. We’re going to plow right through it and do our job." 3. 🌊 "Epic feat of political re-engineering"
Shot: "Saddled with an unpopular president and getting little or no traction from a robust economy, Republicans have settled on a blunt-force strategy as they struggle to hang onto the House in November: Paint the opposition as wild-eyed and dangerous," the L.A. Times' Mark Z. Barabak reports. "[T]he GOP and its allies are spending tens of millions of dollars attempting ... to turn the election from a classic referendum on President Trump into an up-or-down vote on challengers." "The surging optimism among Democrats, usually shared in private, has begun to spill into the open as ... Trump’s approval ratings sink." "Democratic confidence is particularly strong among campaign operatives who work closely with women ... Polls suggest women are turbocharged and eager to punish Trump’s party." 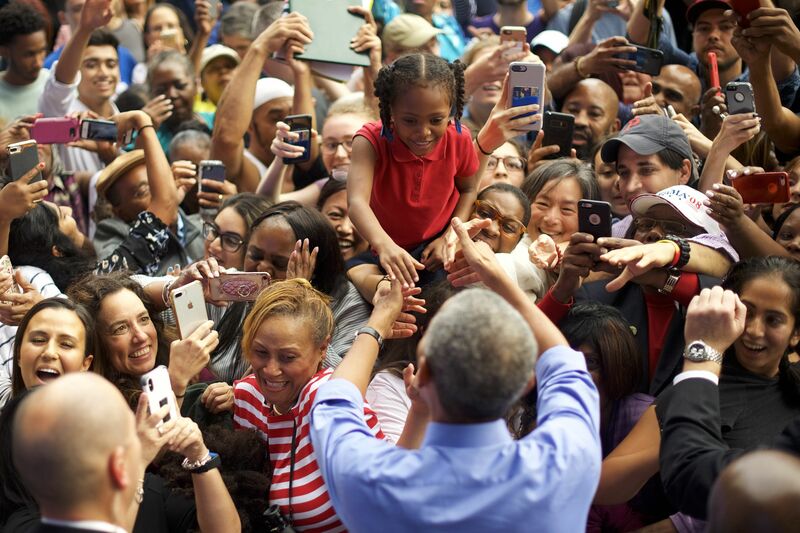 Former President Obama working a campaign rally in Philadelphia yesterday. "The memo, authored by a Google engineer who was asked to work on the project, disclosed that the search system, codenamed Dragonfly, would require users to log in to perform searches, track their location — and share the resulting history with a Chinese partner." "[U]sers’ searches would be associated with their personal phone number. The memo adds that Chinese users’ movements would also be stored, along with the IP address of their device and links they clicked on." "The memo was shared earlier this month among a group of Google employees who have been organizing internal protests over the censored search system." "Google human resources personnel emailed employees who were believed to have accessed or saved copies of the memo and ordered them to immediately delete it from their computers. Emails demanding deletion of the memo contained 'pixel trackers' that notified human resource managers when their messages had been read, recipients determined." Major U.S. carriers plan to deploy mobile 5G networks by early next year, with some early efforts planned for later this year, Axios' Ina Fried reports. All of the Big 4 carriers plan to offer 5G mobile cell service in the first half of next year, when the first 5G-ready smartphones arrive. Watch your email later today for an Axios AM Deep Dive on "The 5G Future." "In [one] video, ... BEP members will.i.am and Taboo ... portray a teacher and a gym coach ... Apl.de.ap is a police officer." "The second video focuses on border patrol officers stopping immigrants from crossing the U.S. border." "[P]roceeds from the song will benefit the student-led March for Our Lives ... and Families Belong Together, a protest against the Trump administration policy of separating children from families after they are detained crossing the U.S. border illegally."